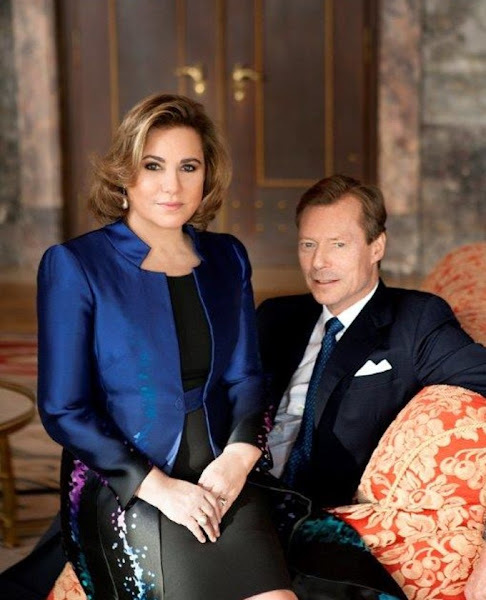 New photos of Grand Duke Henri of Luxembourg and Grand Duchess Maria Teresa of Luxembourg, the couple will be celebrating their 35th wedding anniversary this valentines day. Too much photoshop! They doesn't look real especially the grand duchess! I agree about the Photoshopping, most of the pictures of the Grand Duchess are photoshopped to make her look younger or slimmer. She is lovey just as she is. I like that couple very much. He adores her. It is so sweet! But I wonder about those pictures, why is she always sitting on his lap / is standing above him? Could not the photographer change the pose? She is sitting on the arm of the chair, not his lap. He is sitting in the seat of the chair. She is not sitting in his lap but. it is simple photography positions when there is a large height difference between the subjects. She is too short and these poses make her look similar height to her husband. Agree on photoshop - too much under the eyes and everywhere. You can see who is the boss! It looks like that. I guess that they ares sophisticated. Beautiful photos of a lovely couple! I have wondered for a long time why you rarely feature such a beautiful and happy-looking couple. They are not "old" as we think of people these days. Women of her size and shape would probably appreciate seeing some ideas for attractive clothes, too. Not everyone is tall and slender. She's not matronly at all. If I think of the word matron, I rather connect it with her daughter-in-law Stephanie. Maria Teresa has much more "punch", vibrancy and internal youth than that woman in her early thirties. If you look back at the story of a few days ago about a film made of a year in the life of this family (Kinneskanner) you will see photos of Maria Teresa that are un-retouched and she looks smooth-skinned and quite youthful. The couple will both be 60 very soon and look marvelous for that age. wow she looks fantastic here. they are one beautiful couple. well done and congrats!!! Odd photos, and Maria Teresa seems to be the focus. Seriously, that is not the face of a 59-year-old. Why all the photoshopping to make her look half her age, not a wrinkle in sight - not good. Schööön!! Ein wirklich sympathisches Paar. She looks very nice in real life , why to make her look unrealistic for her age in the photo? Photoshopping is vey stupid idea for anyone! Photo should reflect how you really look. I agree with the comments on here ! Grand Duchess is a very attractive woman, and shouldn't need to have had any photographs manipulated or enhanced ! I hope this is a fairy tale marriage but I do recall a few years ago that there were rumors of trouble.